Preheat oven to 450 degrees F. Prepare turkey bacon according to directions. Cut into 1-inch size pieces and drain on paper towels. Brush each uncooked pizza crust with olive oil from sun-dried tomatoes. 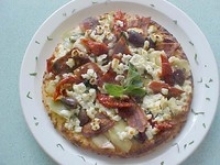 Top with Kalamata olives, sun-dried tomato slices, artichoke hearts, basil, oregano, ground pepper and bacon pieces. Cover each pizzette evenly with 3 ounces crumbled Feta cheese. Bake in oven until bottom crust is browned and cheese is melted, approximately 6 minutes. Serve on individual plates with a sprig of fresh basil for garnish.